Getting your child to pause for a moment to do a body scan can be, uh hum (clear throat), sometimes challenging. At least it has been in my experience. Let’s face it, we are a world on the run, most of the time, and our moments are crammed with appointments, outings, events, playmates, and encounters of the friend kind. However, one of the first steps in teaching your child calming techniques, is to get her to pay attention, with detail, to what is going on inside her body. You must be able to recognize tension, and discern where it is in the body, before you can do anything about it (such as, start a calming technique). Assume comfortable position. Begin to turn your eyes and ears inward to listen to the body and pay attention to how you are feeling. Breathe slowly in and out. Repeat. In and out. Excellent work. Bring your attention to your toes on your left foot. How do they feel? Now check your left ankle. Can you feel it? If not, wiggle it a little bit. Now check in with your left leg. Is there any stress or tension there? Breathe. Imagine that you are releasing any tension that you find, like pulling the lid off of a jar of steam. Good! Let’s focus on the toes of your right foot. Wiggle them a bit. How do they feel? Let go of any tension that you find. Now your right ankle. Now pay attention to your right leg. Breathe. Relax. Excellent! Now we check in with your lower back. How is your back touching the floor or chair? How does your stomach feel? Any time you find some stress, just let it go, like a puff of steam into the air. Good. Pay attention to the back of your neck. How does it feel? Check in with your head. Does it feel light or heavy? Feel your ears, the roots of your hair, your forehead, your cheeks. Can you feel your teeth? How do they feel? How does your tongue feel inside your mouth? Feel the top of your head. Breathe. Relax. Did you find tension anywhere? If so, just allow it to melt into the floor, to fall away from you. Now sit quietly for a few seconds. Check out your whole body. Imagine a cloud of relaxation is ready to swish right over all of you, taking with it any stress or tension that you found. Great work!!!! Now you know just where stress or tension likes to hide in your body. Explain to your child that Stress Bot is always on call to help him scan his body to see if there is tension or stress there. Invite him to call upon Stress Bot any time he is not feeling good to see where the source of the feeling is inside his body. 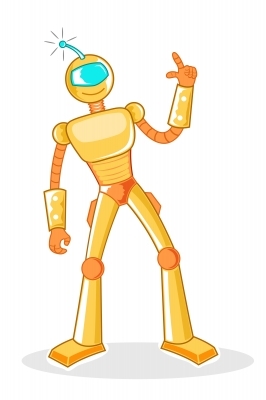 After Stress Bot helps him find the stress, he can use one of his favorite relaxation tools to help get the stress out of his body and begin to feel good and more relaxed. Hands on head. How is it feelings? Hands on heart. How is it beating? Hands together. Calm or shaking? Breathe and do a body scan. Very cute! I am a child therapist and can certainly use more techniques on helping kids toidentify stress and tension in their bodies. I’ve posted this on my FB page as well at http://www.facebook.com/kimscounseling. Thanks!